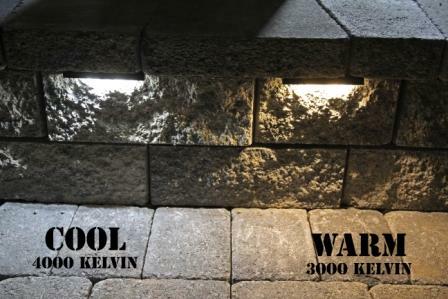 Our two different sized Kerr Lighting 12 Volt Retaining Wall Lights will guide you and your guests into your walkway, driveway, around pools and patios ...anywhere retaining walls are present. 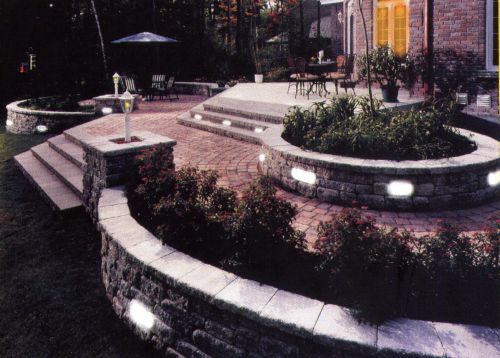 Retaining Wall Lights are a completely safe system which can be applied to residential or commercial applications while creating a dynamic accent to your landscape. 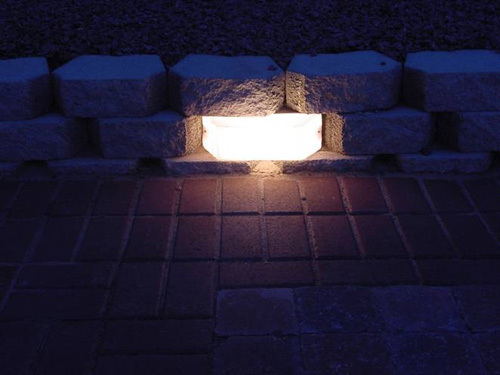 The light fixture replaces a retaining wall block either 6" x 8" or 12" x 4" as a structural unit of the retaining wall while adding the beauty of light where needed. 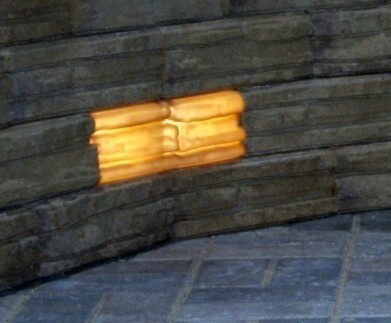 Our 12" x 4" lights now come with 3 different textured fronts to blend into different styles of walls. As of 2014, we have replacement LED units that replace the 7 watt incandesant bulbs with energy efficient LEDs that come with a 5-year warranty. 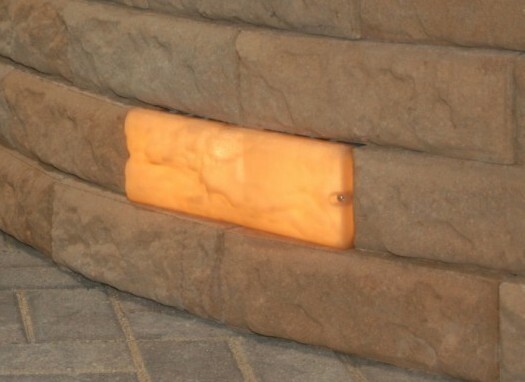 For downlighting the face of a wall, or safety on stairs, we offer "WALL EYE II" which are a low power (2 watt) LED fixture which is only 1/32" thick that mounts under any retaining wall coping stone or step tread. 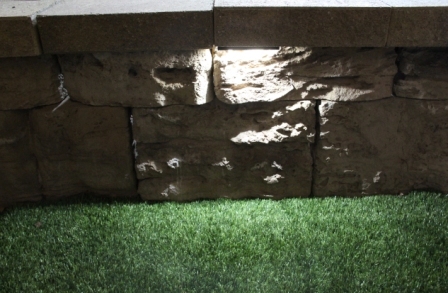 These energy efficient lights come in a Cool (4000 K) White LED or a Warm (3000 K) White LED. 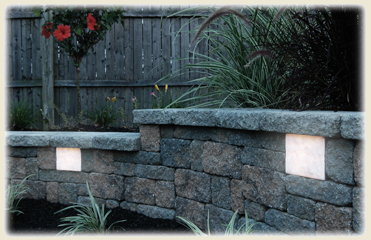 Wall Eye II lights work with any standard Low-Voltage Transformer with a 12 volt output. 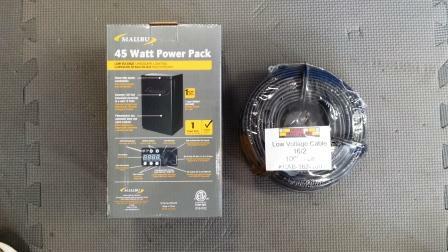 Because of their unique built-in electronic driver, these Wall Eye II will work on both 12 volt AC and DC power making them very versitile for many different types of applications. The Stainless steel housings and sealed LED units allow for installation near salt and freshwater applications. NOTE: To calculate shipping costs: Add a product to the shopping cart. An orange colored "Calculate Shipping" tab will now show up on the right side of your screen in the blue area in the shopping cart section. Click on this "Calculate Shipping" and enter your zip code. Hit "Submit", and your shipping options & delivery times will now be displayed. If there is a choice, pick the option that best fits your needs. Canadian customers responsible for duties & import taxes. Wall Eye II-COOL High Quality - LED Technology - 12 volt & 2-watts of draw - 4 different colored finishes - Stainless Steel Housing - FREE SHIPPING! Wall Eye II-WARM High Quality - LED Technology - 12 volt & 2-watts of draw - 4 different colored finishes - Stainless Steel Housing - FREE SHIPPING! LED-COOL These LED modules are a direct replacement for the LED unit on any Wall Eye ll Light. The LED module can also be used in many other applications where a low wattage draw fixture is needed to proved light using a 12 volt (AC or DC) power source. LED-WARM These Warm LED modules are a direct replacement for the LED unit on any Wall Eye ll Light. 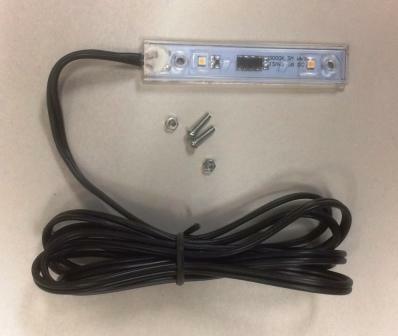 The LED module can also be used in many other applications where a low wattage draw fixture is needed to proved light using a 12 volt (AC or DC) power source. 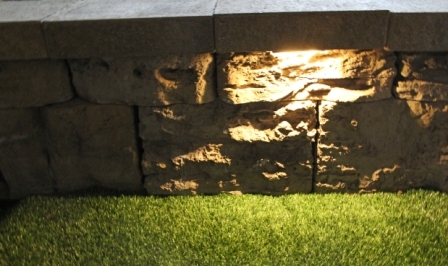 Kerr Retaining Wall Lights Its unique structural design supports the weight and pressures associated with garden walls.